Dale Gieringer is the director of California's National Organization for the Reform of Marijuana Laws, the oldest cannabis lobbying organization in the world. 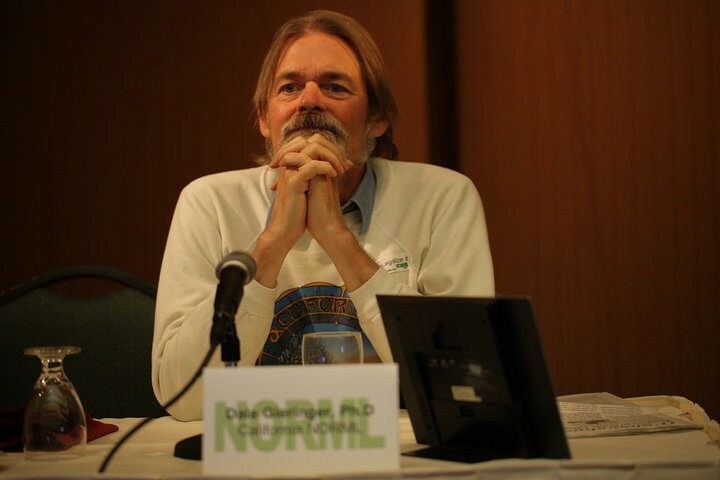 He has been at the heart of the cannabis legalization movement for decades. Gieringer's sharpest memories are about the campaigns to decriminalize and legalize marijuana. "I was surprised by how many friends of mine who had been longtime pot smokers suddenly came out of the closet with the passage of Proposition 215—the Compassionate Use Act—that legalized medical marijuana 21 years ago," Gieringer says. "Suddenly, healthy people had all kinds of health issues. I never regarded myself as a medical marijuana user, and I resisted going their way." "The net result of 215 was positive," he adds. "It helped reduce arrests, and it made many Americans feel comfortable with the sale of pot to adults." For Gieringer, the cause of marijuana has always been about personal freedom and the unconstitutionally of the drug wars. Moreover, Northern California was, for him, the place to be. "I fell in love with the wilderness, and thought that raids with helicopters and troops were desecrating it." The way Gieringer sees it, the tipping point for legalization came in 2008 right before Obama moved into the White House. "Under Bush, people thought the cause was hopeless," he says. "Then, with Obama's victory, they started to say, 'We can do it.' Indeed, we legalized adult use in Colorado, Oregon, Washington and California. Sometimes you have to wait for the wave to come before you can ride it." Gieringer's pot prognosis was upended when Trump won the 2016 election. "I expected that Hillary would win and that her victory at the polls would lead to a change in the federal government," he says. "If someone had said in 1996 that federal law would be the same 21 years later, I would have been dumbfounded." Where do we stand now? "I believe [Attorney General Jeff Sessions] would like a crackdown on marijuana, and I wouldn't be surprised if the feds initiate lawsuits against the industry," Gieringer says. "They can arrest California growers who are shipping out of state, but thousands of growers are doing that. They can't stop them all. As I see it, the California cannabis industry will continue full speed ahead in the next year or so, with the black market as strong as ever." Gieringer expects to be around for the battles yet to come. "The feds can't put the genie back in the bottle," he saysd. "Marijuana use is so widespread and so widely accepted, we can't go back to the days of reefer madness."